Hello and hump day to you lovelies. Can you believe that the school holidays are like a week and a half away? Holy smokes they came around quick. I've barely restored the house to order after the hurricane that was the last school holidays and BAM... they're back again. We aren't going away anywhere these holidays (cue the violins), in fact I am pretty much planning on working the whole way through give or take a few outings here and there (cue the whole damn orchestra). In amongst all the awesome workshops we have coming up at DTLL Workshops, we have included a few school holiday's kids workshops and there are more to come. So on that note it would be totally remiss of me if I didn't share with you some of that awesomeness we have lined up in case you are in Sydney and you are looking for something to entertain your kids or for you to escape to for a little mid holiday time out. Now if you'll excuse me, I have kids to get ready for the school play and I need to set up Foxtel to record the Bachelor. 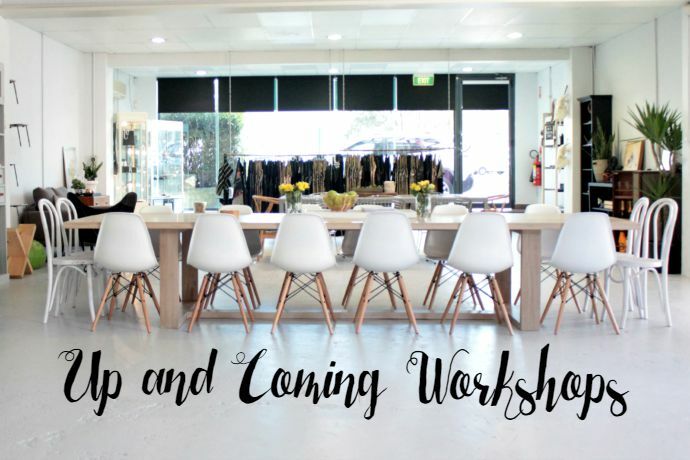 Click on the images to view the workshop details or book a ticket.